Though stretching and strengthening are great activities to improve joint and soft tissue mobility, sometimes it is not enough to keep movement-impeding restrictions from forming. That’s why taking a hands-on approach to self-tissue manipulation is additionally beneficial for runners. Listed below are some examples of soft tissue work you can do at home to target the tissues we have been concentrating on the past three weeks. There are several options for what type of ball you can use. We have found that lacrosse balls seem to have a nice balance between hard and soft. However, golf balls and tennis balls also do the trick. Roll the ball along the bottom of the foot from the ball of the foot to the heel. Perform it with the big toe flexed and extended to get into the tissues differently. Do for 1-2 minutes each foot. Perform soft tissue work on the calf in a half kneeling position placing moderate tension on the target tissues. 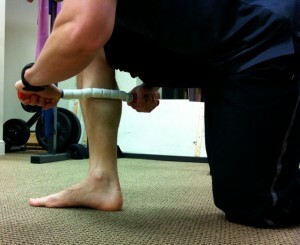 Make sure to work the entire length of the calf in the center and the medial and lateral sides 1-2 minutes each legs. The instrument being used in the photograph is called “the stick”. If you do not have something like this you can use a rolling pin from the kitchen or a 1-inch dowel rod. Working on soft tissue mobility through the foot and ankle can make a big difference in your running performance. For more information on running, run training, and how to run better,like us on Facebook , follow us on Twitter, or contact our office.